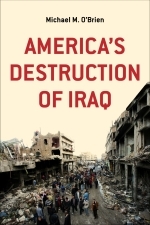 In America’s Destruction of Iraq, Washington insider Michael M. O’Brien details the origins of radical Islamic terrorism now spreading as Islamtic State across the Middle East and North Africa. Lack of leadership and courage to destroy the enemy, two main tasks for generals in post World War II era. O’Brien unravels a pattern in the Vietnam War, the Gulf War (1990-91), Operation Iraqi Freedom 2003-2011). Though appointee in the administration of George W. Bush and housing / construction contractor in Iraq, the author discovered so much oddities, that he turned away from staying silent and felt urged to write this book. Readers not familiar with the several phases in the wars in Iraq, the commanders and organizations fighting for opportunities to get a market share in the “military-industrial complex” President Eisenhower warned America of in 1961. It was and is costing billions to U.S. taxpayers. You’re introduced to all of these step by step. Lean from the lives and behaviors of Colin Powell, George W. Casey, David Petraeus, Tommy Franks, Norman Schwarzkopf the stupidity of letting Saddam Hussein flee to Baghdad, the Weapons of Mass Destruction lies and the bureaucracy. The result is no easy night stand reading stuff. No happy end or real heroes here. Frustration, destruction, vengeance, political and military mismanagement, and an astonishing series of names and facts to support O’Brien’s conclusions. The author is harsh, and doesn’t do any window dressing. The overdose of negativity in full-length descriptions however were too much for me to read along to the last page. That being said from a Western-European perspective. Michael O’Brien is an outlier: a conservative and former political appointee in the, with an abiding contempt for the of the Iraq War, officially referred to as Operation Iraqi Freedom. A graduate of West Point and former Infantry officer, and a former U.S. government Contracting Officer, O’Brien saw the effects of the Iraq invasion from the inside out—not as a soldier but as a contractor advising the new Iraqi Army and Ministry of Defense on its physical infrastructure, including the acquisition of land and Forward Operating Bases (FOBs) originally built for Coalition forces. The author graciously provided me with a copy of this book and asked me to write a review.